Although it may seem simple at first, as you begin to play more hands and see more showdowns, certain situations will occur where the winner of a hand may seem uncertain. This hand rank FAQ should cover any questions you may have regarding the rank of hands in Texas Hold'em. Do certain suits have higher ranks than others? No, each suit is equal to any other. For example, a royal flush in spades is equal to a royal flush in hearts. What happens if both players have the same hand? This would be declared a split pot, and each player will receive half of the pot. It's quite common. Does the use of more holecards increase the strength of your hand? 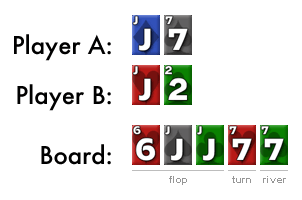 Just because player A can use both of his holecards to make the same full house, it does not make his hand better than player B’s (Jacks full of sevens). They can both make the same ranking hand, therefore it will be a split pot. What happens if both players have a high card of an Ace as their best hand? The player that holds the card of the second highest rank in their hand will be determined the winner. In the situation below player A would beat player B. Once again, if both player’s top two high cards are the same, the next high card will be looked at to determine the winner of the hand (and so on). 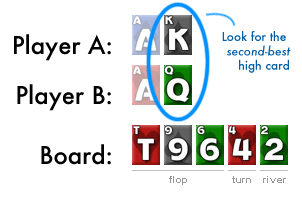 This rule is also used when two players have hands that are the same such as 3 of a kind or a flush. If two players had 3 of a kind of the same rank, the high cards would determine the winner of the hand. The same applies to the flush; the person that has the highest card making the flush is the winner. How is it decided which full house is better than another? The player with the higher 3 of a kind wins. 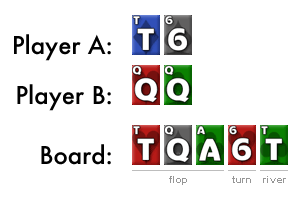 For example player B in this hand would win, because his 3 of a kind (QQQ) is higher than player A’s (TTT). Are Aces high or low?